Aquascape Pond Supplies: Bulk pond salt 40 lb. Pond Salt 40 lb by Aquascape will help reduce the effects of elevated nitrite levels that are harmful to all pond fish. Aquascape’s salt can be used tohelp restore natural electrolytes, aloowing proper gill function when pond fish have been under a large amount of stress. The salt will also help promote the fish’s natural slime coat, which is needed for disease prevention. If you own pond fish such as koi fish, goldfish, catfish or any other type, you should already be using pond salt by Aquascape. We highly recommend Aquascape because they are the leading manufacturer when it comes to everything that is pond related. 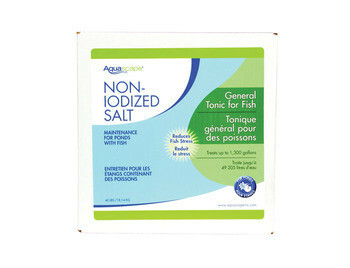 If you want to keep your fish in good health, Pond Salt 2 lb by Aquascape is highly recommended. Take note, this product right here is 40 lbs, which will last for a long time, depending on the size of your pond. If you have a smaller pond, you may be interested in the 2 lb or 9 lb bag that we currently have for sale. Aquascape Bulk pond salt 40 lb. Filed under: Aquascape Pond Supplies / Fish Care & Food / Salt / Bulk pond salt 40 lb.